A premium door chime from Honeywell with the option of adding on security accessories offering peace of mind and custom upgrade possibilities. 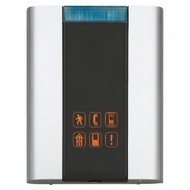 Add-on push buttons for other entrances around the home, door and window contacts for added security, or motion detectors for peace of mind inside and out. The RCWL330A incorporates six (6) visual alert icons to let you know which device has been triggered with an exclusive event log so you can recall which devices were last triggered in case you missed a call. The product has the flexibility to go wherever you want it, on the wall, on the patio, or in the basement, and the industry best 450 foot operating range provides the performance to work virtually anywhere in, out, or around your home. CD quality sound and fully adjustable volume round out the features for this door chime plus security product.